Back in law school Sally Stowe and Colin Foster argued in and out of class. One night, after a study session in the library, Colin offered to drive Sally home. They ended up in his room making love. The next day Sally discovered that her best friend, Beth, was really into this guy in Sally’s class—Colin. Sally stepped aside and started seeing someone new. Sixteen years later Sally is a distinguished lawyer, up for a judicial appointment, and Colin is Beth’s widower. As Sally and Colin spend more and more time together, a horrible suspicion takes hold. Could Sally’s daughter be Colin’s? A difficult moral dilemma is at the heart of many stories I write. This story is no different. The predicament is one I’m sure you can relate to. Imagine you are a law student in your last year of university. There’s this guy who has been in many of your classes...and something about him really gets to you. He’s good looking, charming and way too smart for his own good. You keep wanting to show him up. Then one night, you’re at the library late at night together and he offers you a ride home. Sparks fly, and before you know it, this guy you thought you couldn’t stand is someone you just can’t resist.The next morning you check in with your roommate and best friend. Before you can tell her what happened last night, she tells you about this guy she really likes—and it’s your guy!Do you tell her to back off? Or do you leave the field clear for your friend?In the story you’re about to read, Sally Stowe faced just this situation. Sally decided to date someone else and leave the guy for her friend...and the repercussions of that decision still live with her—and her daughter--ten years later. 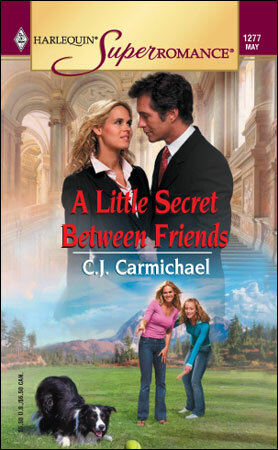 Interesting fact: This is one of the few books I've written that's set in the city where I live: Calgary, Alberta. I'm not sure why I usually pick other settings--maybe so I have an excuse to travel? Crown prosecutor, Colin Foster was home watching the hockey game when the phone rang. He'd boiled himself some bacon and onion perogies for dinner and a plate smeared with sour cream sat on his footstool next to a half empty beer. The Flames had made the playoffs and were into overtime with the Canucks to tie the series. He didn't want to answer the damn call, but when he leaned over and saw the name on display, his priorities took a sudden shift. Sally Stowe. Why was she phoning? He couldn't think of a single reason. But there were plenty why she wouldn't. He hit mute on the remote control. His living room went bizarrely silent as the action continued on the big screen T.V. Leaning forward in his leather chair, he pressed the talk button. Nothing. Then some muffled, indistinguishable noises. "Sally, is that you? " Was that a sob? "Are you all right?" More muffled noises, barely discernable as words. And then one word, very faintly. "Beth." "Sally? " Why was she asking for his wife? What was going on? But there was only silence from the line. Colin waited for several seconds, maybe even a whole minute. When nothing else happened he finally hung up and tried to think of explanations. Sally Stowe had been his wife's best friend. In the past she would phone here all the time. But not at all for the past six months. Had she dialed the number by mistake? He could see that happening, easily enough. But Sally would have apologized as soon as she'd realized her error. Something must be wrong. Sally's place wasn't far. He'd better drive over and make sure she and Lara were all right. Colin turned off the T.V., then grabbed Beth's key chain from the hall. He was pretty sure his wife had kept a spare for Sally's house. They used to water plants and bring in mail when either one went on a trip without the other. Best friends. Yes, they'd been best friends all right. For as long as he'd known them, they'd been closer than sisters. They celebrated birthdays together, went on annual girl-holidays and dyed each other's hair. They'd even decided to move into the same neighborhood so they would be close to each other. Colin hadn't minded. He was happy with the Elbow Valley home he and Beth had selected. And the community, with its network of biking trails, connected green spaces, and a frozen pond for skating in the winter, would have been a perfect place to raise kids. If he and Beth had only managed to have them. Colin went through the laundry room to the three-car garage, hitting the power button for the door opener on his way to the SUV. As he passed the Miata convertible Beth had loved so much, he felt a twinge of guilt. There was so much he'd let slide this last while. He knew the registration on the Miata was expired, and so was the insurance, probably. Beth's clothes were still in her closet, her mail unopened. Hell, he was pretty sure there was a container of her yogurt in the back of the fridge. Probably more mold than yogurt by now. He had to start dealing with all this. Pull together the pieces that were left of his life. As he backed his vehicle out of the garage, Colin made a promise to himself. He was going to make a list and get busy. Not tonight, but tomorrow for sure. First he had to find out why Sally Stowe was calling a woman who had been dead for six months. Sally wasn't sure how long she'd lain on the floor--fifteen minutes? Maybe twenty?—when she heard knocking at the front door. Not Neil, was her first coherent thought. He would have just barged in. So then, who? She wasn't expecting anyone. Must be a canvasser or something. She tried to sit up, then moaned. Her head hurt so much, she must have a concussion. But her injuries couldn't be too serious. She was conscious and her mind was working all right. Wasn't it? Let's see, she was Sally Stowe and today was April the twenty-third and the capital of Alberta was...Edmonton. Yes, she was fine, she was absolutely fine. If only she could pick herself up from the floor. There was a second knock, this one at the kitchen door. For a second she panicked. Maybe it was Neil, checking to see if she was alive. Armani whined, and she put a reassuring hand on his back. She wished someone could do the same for her. Neil had never been physically violent before. She didn't know what to make of it. The door opened. A voice called out, "Sally? Are you home?" Not Neil. Relief was quickly replaced by a different kind of alarm. What was Colin Foster doing in her home? The island blocked him from her view and it worked vice versa as well. If she kept quiet, maybe he would leave. She certainly didn't want him to see her this way. On the hand, she could use some help. In the end, the decision wasn't Sally's to make. Colin entered the kitchen. He must have seen the blue flame on the stove, because he came rushing around the island and almost tripped over her. "Oh my God, Sally! What happened to you?" He crouched beside her, as Neil had done, only this time she felt no fear. Armani seemed to sense his presence was benign, as well. He stopped whining and lay down at Sally's side. "My head, " she said, barely finding the strength to speak. "My hand. " She lifted it slightly. "You burnt yourself. " Colin reached to the stove and switched off the burner. "Badly. And you've hit your head. It's still bleeding. " He opened drawers until he found the clean tea towels. Taking several, he made a compress and applied it to her wound. He tied one of the towels completely around her head to hold the others in place. Then he found a bowl, filled it with cold water and immersed her burned hand. The relief from pain was instantaneous. "Talk to me, Sal. Are you okay?" "I'm fine. My name is Sally Elizabeth Stowe and it's Friday the twenty-third." He looked taken aback at first, and then he smiled. "Well, your mind is working all right. But then it always has." This coming from a man who had spent the past decade and a half debating almost everything she said, was a compliment, Sally knew. "What a lot of blood." His face was awfully white, Sally noticed. He'd aged since Beth's death, but not unattractively. A little gray sprinkled in with the chestnut brown. A few more lines spreading out from the corners of his alert, probing eyes. "Head injuries always bleed profusely, Colin." She remembered Lara, when she was two, splitting her head open on the stone hearth of their first rental home, and the amazing amount of blood she'd lost in a relatively short time. Sally had hit the panic button then, but at Emergency Lara had received three stitches and been pronounced fine. On the drive home, Neil had bitterly castigated Sally for her carelessness, conveniently forgetting that she had asked him to keep an eye on Lara while she folded the laundry. "Must have been a hell of a fall, Sal. Did you burn your hand, then lose your balance?" She closed her eyes, remembering the vile sneer on Neil's face the second before he'd given her that second shove. The ice-man smile. She doubted if any of Neil's colleagues would believe that the polished, urbane man who was one of the city's most accomplished criminal lawyers had this darker side. Besides, even if Colin did believe her, she wasn't sure she wanted him to know. "That must be what happened. It's all kind of blurry right now."